Taxol Injections distributors, dealers & suppliers in Mumbai. 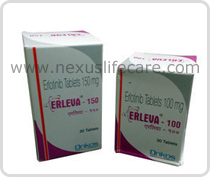 Uses:- Erleva Tablet is a first-line drug for the treatment of metastic non-small cell lung cncer. Erleva Tablet is also used as combined therapy with gemtitabine as the first line therapy for the treatment of locally-advanced inoperable, or metastatic pancreatic cancer. Side Effects:- Burning, tingling, numbness or pain in the hands, arms, feet, or legs, cough or hoarseness, lower back or side pain, fever or chills.